Located in the rural area of the Central Plateau, La Chambre is a farming community that is surrounded by the river Bouhaya. 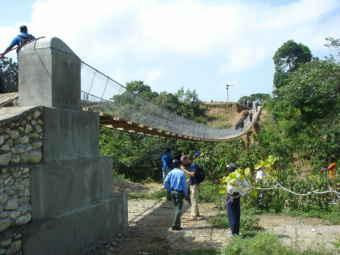 The 10,000 inhabitants of La Chambre rely on their ability to cross the river to have access to their basic needs, which include selling local goods in the neighboring market at Hinche, accessing medical care at Saint-Joseph hospital in the town of Hinche, and gaining access to education at Los Mamonde. Prior to the bridge construction, heavy rains isolated the people of La Chambre from these basic needs for up to 6 months out of the year. The La Chambre project was the initiative of the association GRADPEC, especially Pastor Lavoisier and Jean Labossiere with the support of Andre Renard the mayor of Hinche. Virginia Tech Students have given their technical support to the design and construction of the bridge. The bridge was completed in the summer of 2012.